1. First the benefit: If you’ve signed up for one of CMHK’s prepaid mobile data plans (one day, seven days or a month), you can access China Mobile’s WiFi Hotspots throughout Hong Kong and Kowloon. “CMHK” is the China Mobile hotspot. This is a valuable free add-on as there aren’t many free WiFi hotspots in Hong Kong. Starbucks and other coffee shops in Hong Kong only provide 30 minutes of free WiFi access with your purchase. To use the China Mobile prepaid mobile WiFi add-on, you will need to setup a password on your prepaid mobile phone card. To setup a password, press “*124*<6 digit number of your preferred password>” on your handset. For example, *124*123456 where 123456 is your password. 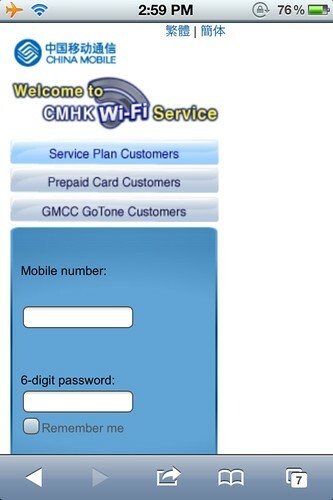 To use the CMHK Hotspot, you will login using your prepaid mobile number and password. The WiFi network is pretty fast. 2. Now the “gotcha”: If you’ve signed up for a daily, weekly or monthly plan and you don’t want to renew the mobile data plan, you must make sure you have deactivated mobile data from your prepaid account. No one will tell you that you will need to disable mobile data from the prepaid plan as I have found out the hard way – watching my HK$50 credit drained to HK$0.15 in less than one day. If you do not deactivated mobile data on your prepaid card, China Mobile will charge you on their regular data rate which is highway robbery. Most smartphones have applications that uses mobile data in the background which will drain your prepaid mobile account at HK$0.15 per KB. So if you do not want to use CMHK’s a la carte mobile data plan, you must deactivate your mobile phone from using CMHK’s data network. To deactivate from CMHK’s data network, you will need to send the following code using your mobile phone: “*106*02#”. To re-activate mobile data service, just send: “*106*01#” from your mobile phone. You can also use “disable mobile data” feature from your mobile phone if it has such a feature. I know that most Blackberries have it. 3. Another “gotcha” is: your CMHK prepaid card must have a dollar value in order for you to continue to use your mobile data plan. For example, you purchased a one week prepaid mobile data plan for HK$38 and have HK$10 left on your prepaid account. Once your prepaid mobile account cannot fall to HK$0, you will not be able to use your prepaid mobile data plan even thought you have already subscribed for the service.